Inside St George’s Chapel the stonework and bosses of the North Quire Aisle have been cleaned as have those of the Urswick chantry. In the North Quire Aisle the cleaning included the stonework of the Hastings Chantry where fragments of gilded stone were found tucked where they had fallen many years ago behind small stone carved finials. Cleaning was undertaken with soft brushes and deionised water. Where dirt was particularly bad, gentle poultices were used to draw grime out. 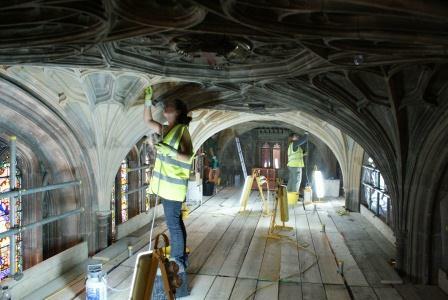 Bosses, decorative carvings placed where sections of stone vaulting meet, were also cleaned. In the North Quire Aisle there are a series of large bosses depicting angels holding shields or other items. The shields bear the arms of Edward the Confessor, St George, William, Lord Hastings and King Edward IV who is buried in the aisle. In the Urswick Chantry the central boss provided a surprise, it was put in place by King George IV. The memorial to his only child (Princess Charlotte), who would have succeeded him to the throne had she survived, is at ground level in the Chantry. The boss was presumed to be carved stone but when conservation was undertaken was found to be made of wood. To find out more about the scheme to support the conservation of the bosses please click here. Outside the Chapel the major work to the Canons’ Cloister continues and scaffolding has been built in the Dean’s Cloister ready for work in that area. 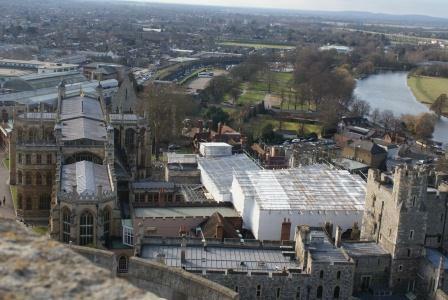 The scale of the area being worked on can be seen in this photograph of the covered scaffolding area taken from the top of the Round Tower. Work taking place beneath the scaffolding is being undertaken by craftsmen and craftswomen from a variety of skilled backgrounds. New lead is being laid on the roof, medieval carpentry skills are used in conjunction with up to the minute methods of fire prevention and detection, wall paintings are being conserved and some walls covered with three layers of horsehair plaster. Stonemasons replaced a few stones around north facing windows and other vulnerable areas whilst cleaning and conserving every other inch of wall. 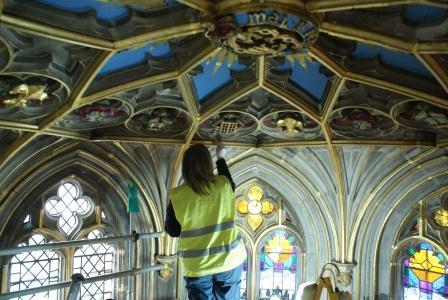 This short film shows some of the lead work on one area of roof at the east end of the Canons’ Cloister.